Born in Zambia, Mayuka’s talent was realised at the very young age of 11. After establishing himself in the young ranks in Zambia, he gained the chance to play for Israeli team Maccabi Tel Aviv in 2008. During his stint at the club, he made 41 appearances, bagging 8 goals in the process. 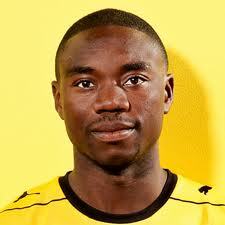 In May 2010, Mayuka moved to his current club Young Boys in Switzerland. His records was much better than his time in Israel, netting 16 goals in 43 appearances for the Swiss side. This season, he has played 2252 minutes for Young Boys, scoring 12 goals and amassing 6 assists in the process. But perhaps he is best known for his brilliant performance in the 2012 African Cup of Nations. Mayuka accumulated 450 minutes during the tournament, finding the net 3 times in the process against Senegal, Libya and (probably the most famous out of the three) Ghana. He was also involved in the AFCON2012 final, scoring the 2nd penalty during the penalty shoot-out against tournament favourites Ivory Coast. His three goals saw him win a golden boot which other players that included the likes of Christopher Katongo and Didier Drogba. Emmanuel Mayuka not only made the Official AFCON2012 Team of the Tournmanet, but also our SFG AFCON2012 Team of the Tournament. Pacey and a deadly finisher, Mayuka is the kind of striker most team would love to have. The odd trickery here and there makes him a player that a defender would need to keep a close eye on throughout the course of a game. Probably his physicality. If he does come to the Premier League (which seems to be a rumour that has been floating around for some time now), he will need to be able to deal with its physical nature (such as rugbyfootball side Stoke). Have any suggestions? Tweet us!